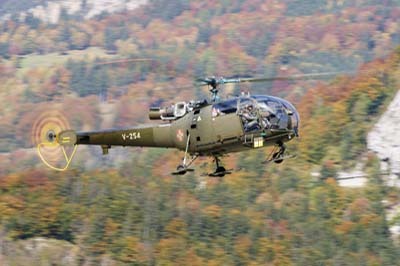 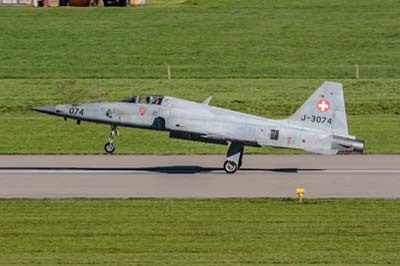 Axalp week 2005, saw plenty of activity at near by Swiss Air Force base - Meiringen-Unterbach. 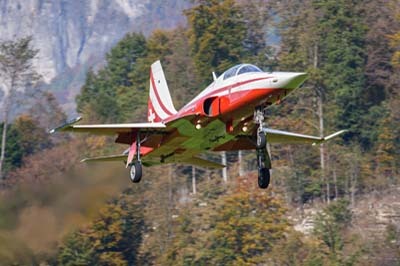 Once again photography here was excellent from the many locations around this very attractive air base. 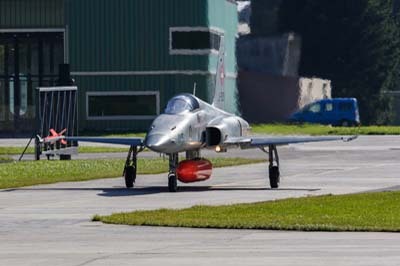 This was a great opportunity to find a few more photographic locations around this stunning air base. 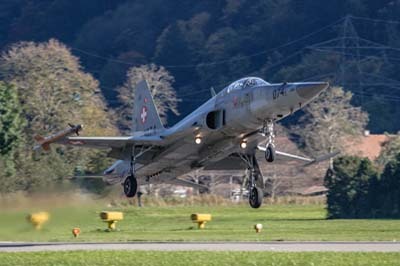 The report "One of the most photogenic airfields in Europe" goes into more detail on the photography and locations at this air base. 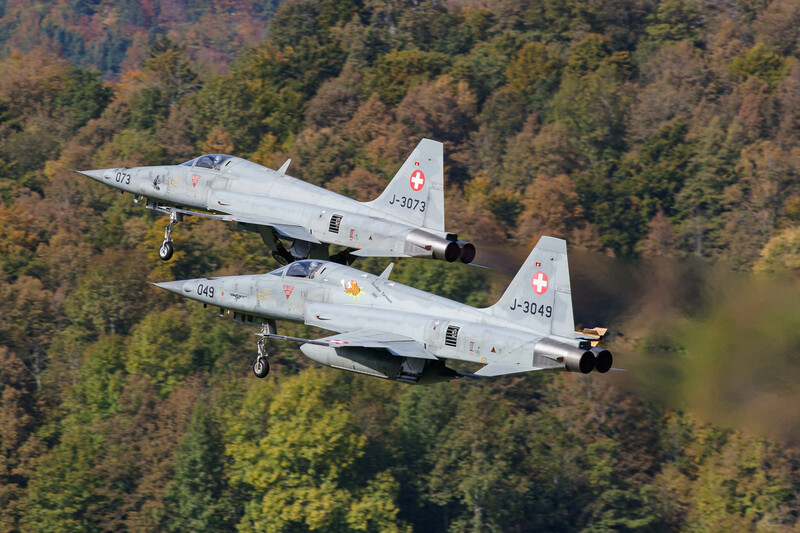 A pair of Northrop F-5E Tiger IIs (J-3049 with J-3073) depart from Meiringen. 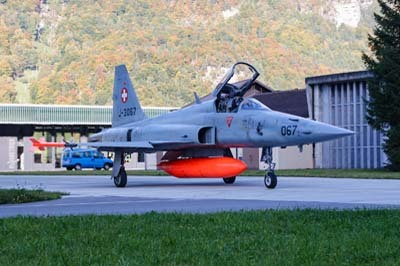 Note: J-3049 still retains the 'Goodbye Turtmann 2003' artwork on the fuselage, from when Turtmann air base was closed. 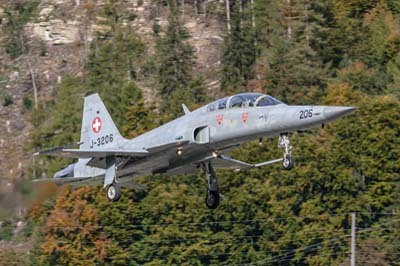 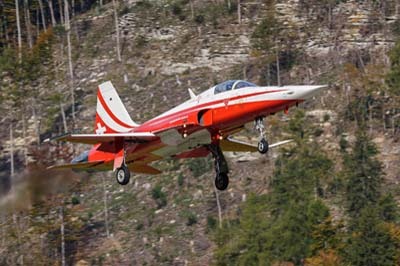 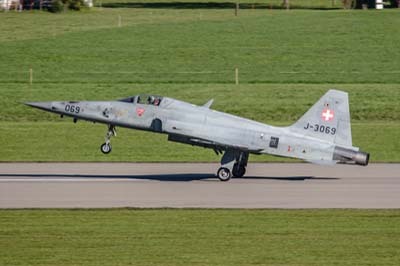 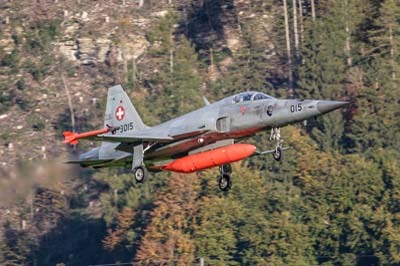 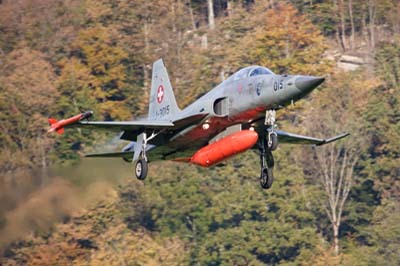 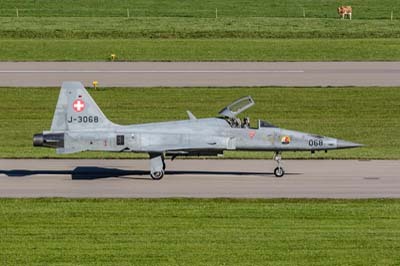 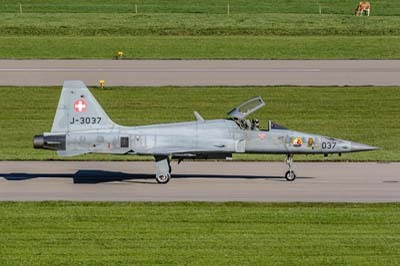 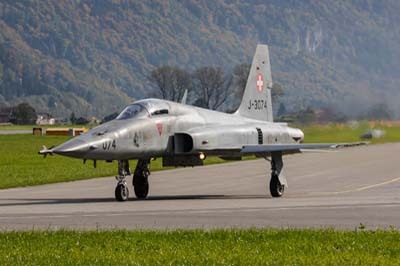 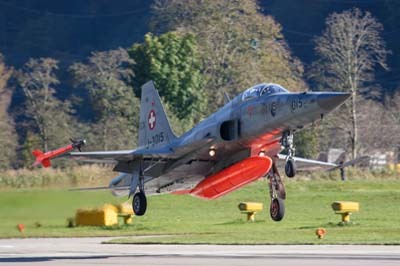 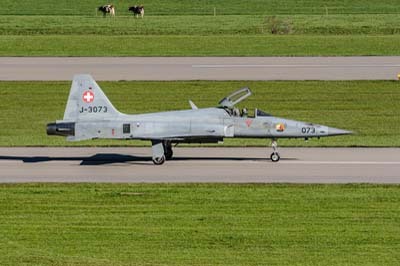 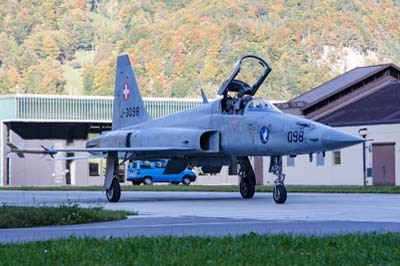 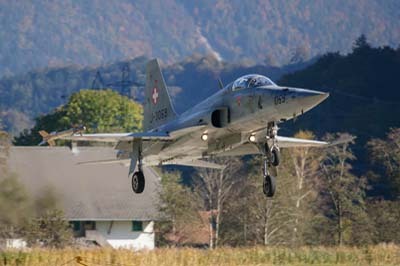 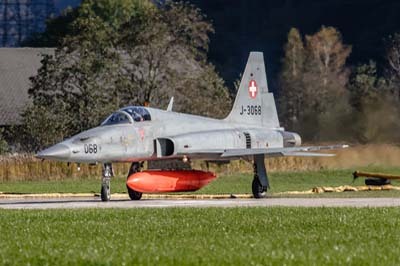 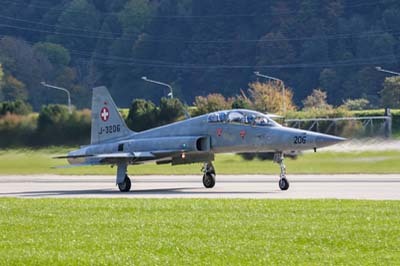 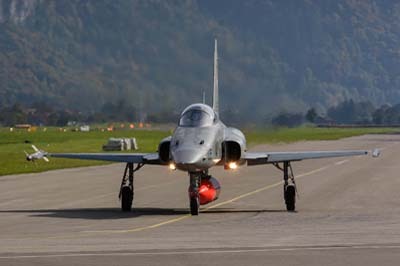 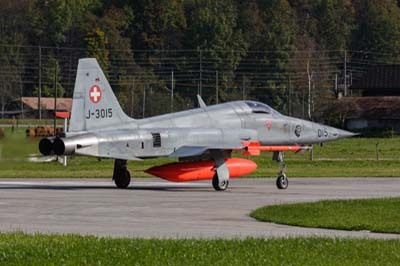 J-3049 was also one of 32 Swiss F-5Es sold to the US Navy for conversion to F-5N. 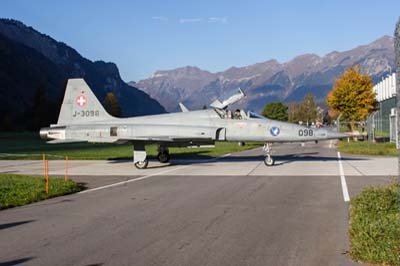 Left to right: F-5Es (J-3098 and J-3079) taxi from the caverns and across the public road towards the runway at the eastern end. 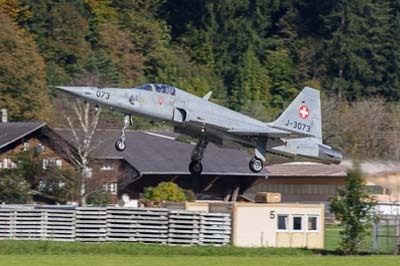 Departing in pairs or as singles taken from the roadside towards western end. 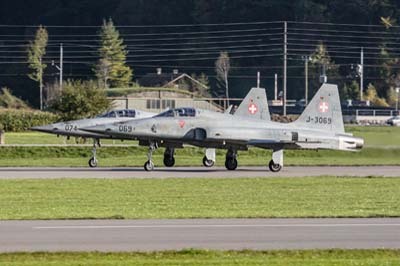 Left to right: Departing F-5Es (J-3069 with J-3074, J-3073) and two F-5Es (J-3069 and J-3074) return after their first sortie of the day. 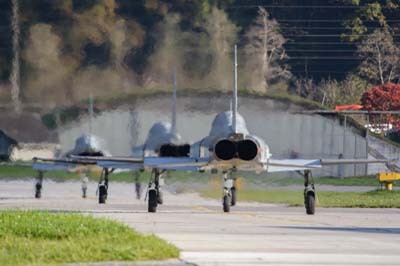 Left to right: F-5Es (J-3073, J-3037, J-3068 and nose of J-3074). 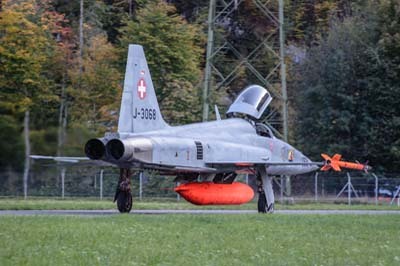 The first three have the Fliegerstaffel 8 badge on the nose, J-3037 also has 'Tiger + 20' nose art. 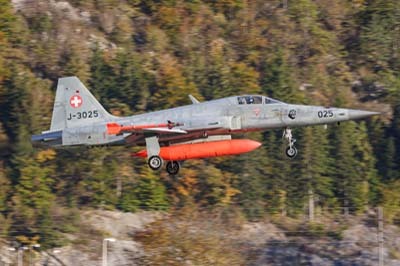 F-5Es (J-3015 and J-3025) with central orange drop tanks and dummy AIM-9P Sidewinder training rounds. 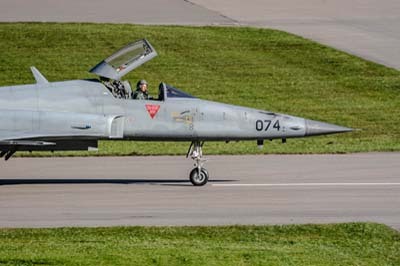 These aircraft are used as 'aggressors' when engaged in Air Combat Manoeuvring (ACM) dog fighting. 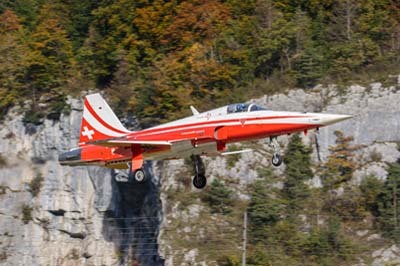 Left to right: F-5F (J-3206) two seat which accompanied two Patrouille Suisse F-5Es (J-3086 and J-3091). 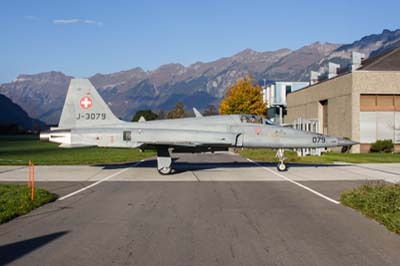 Left to right: F-5Es J-3069, J-3074, J-3025 and about to depart J-3015. 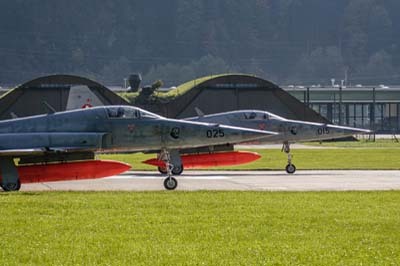 Left to right: F-5E J-3015 taxis out to the runway from the cavern area; J-3068 turns on to the runway; F-5F J-3206 blasts down the runway; aggressors J-3025 with J-3015. 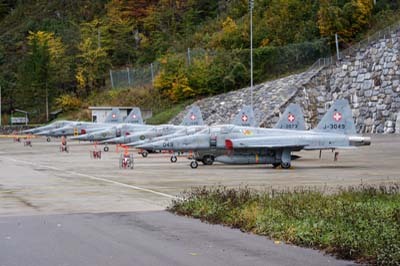 Left to right: F-5Es J-3067, J-3015, J-3069 and J-3074. 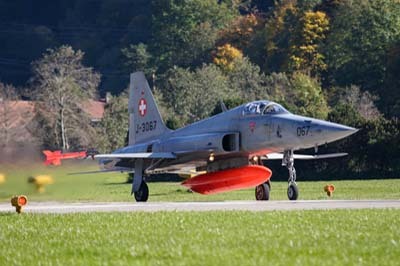 The nose gear has been extended lifting the nose by 3 degrees for the take-off decreasing the rotation point by 50%. 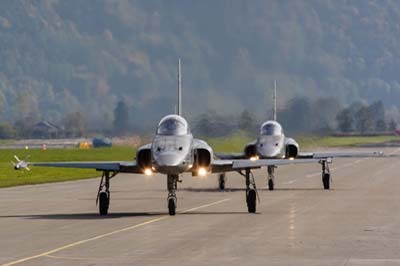 Returning to the caverns at the end of the day F-5Es J-3067, J-3098 and J-3068. 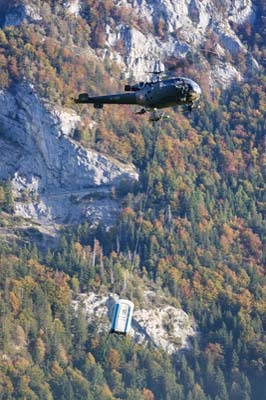 A view of the new cavern ramp area. 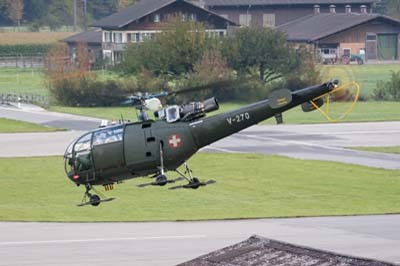 Left to right: Alouette III activity, V-270 departs; V-255 returns with a portable toilet; V-261and V-254 are about to land. 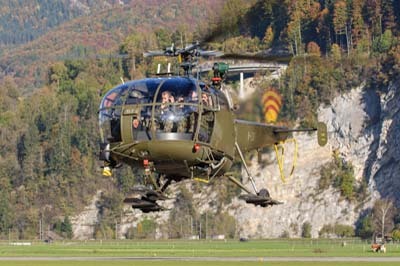 Super Pumas and Cougars were used to transport 300+ VIP's up to Ebenfluh Firing Range each day. 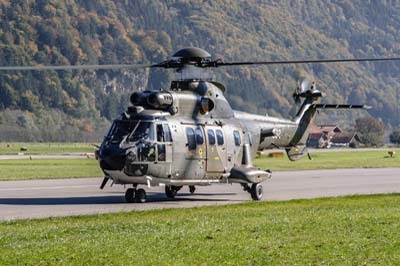 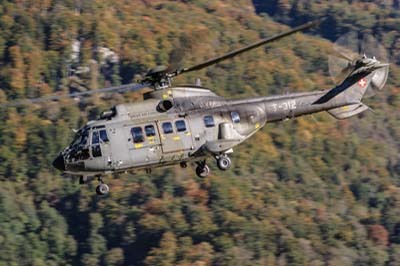 Left to right: Aérospatiale AS.332M-1 Super Puma TH-89 (T-312) and Eurocopter AS.532UL Cougar TH-98 (T-332) with 'ISSYS' self protection system fitted just to left of serial.